Congressman Gene Green is used to attending town hall meetings with low attendance. Last week was an exception. Over 400 people turned out for a town hall meeting hosted by the congressman. The majority was not silent, with many of those in attendance protesting Green, President Obama or the government in general either by voice or sign. Among the complaints was that Green’s office was checking the ID of those attending, and allowing only those who reside within Green’s Congressional District into the meeting room. One protester questioned why Green was opposed to Voter ID, but required an ID at what was supposed to be a public meeting. When Green arrived at the site, he was welcomed with boos and catcalls. One constituent, however, congratulated Green on having the backbone to show up at the meeting. Security was also heavy at the meeting, with the sheriff’s office, constable’s office and local Baytown police department represented in uniform. Despite the large crowd that gathered for the meeting only about one fourth actually got in to hear Green speak. The meeting room at the Baytown library has a maximum capacity of 100 people and a representative from the fire marshal’s office was there to make sure the crowd did not exceed to the 100-person limit. Green apologized for the size of the room, saying he had used the room many times in the past and it had never been a problem before. When he reserved the room in June, he added, he had no idea the attendance would be so large and once he realized he would need more space it was too late to find another meeting place. 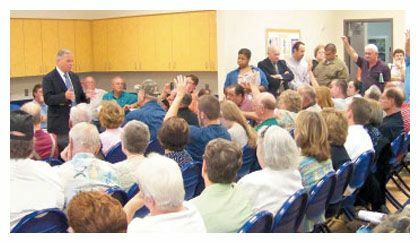 Green defended his decision to only let constituents into the meeting. “They (the protesters) come from outside the district and monopolize the time of the people in the district.” Before the ID checks began, Green said, some 60% of the attendance lived outside the district. “My obligation is to the district I represent,” Green added. Green also took the time to take jabs at the Bush Administration, suggesting that the nation’s financial situation was because of tax cuts and big business bailouts. He suggested going back to the fiscal policies of the late 1990s (when Bill Clinton was president). Green explained that anyone with employer-provided health care is exempted from the bill, and that congressmen, like all federal employees, receive employer-provided health care. The question referred to Obama opponents who say that he was not born in Hawaii as he claims, but rather in Africa and that he is ineligible to serve as president. Green responded that the health care plan does not provide services for non-citizens. 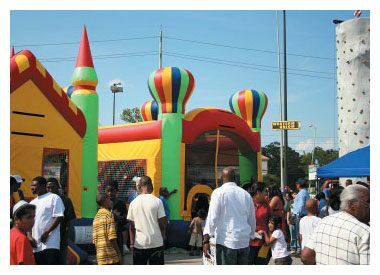 North Forest ISD and Fiesta hosted a Back To School Community Festival on Aug. 15 at the Fiesta Parking Lot on Mesa Rd. The NFISD Back-to-School Fest featured plenty of activities for children including moonwalks and a massive rock wall that offered for kids of all ages. There was also free food and entertainment. Free school uniforms and school supplies were also given to NFISD students. Shouts of “JUST SAY NO” were met with equally intense shouts of “YES WE CAN” many times through a marathon Town Hall meeting that Congresswoman Sheila Jackson-Lee held last Wednesday night at the Northeast Multi-Service Center on Tidwell. An overflow crowd of almost 400 came to give their opinions or ask questions, some politely and some rudely and raucously. Through it all, Jackson-Lee did an excellent job of moderating and keeping the crowd civil. She listened and answered almost 40 speakers who lined up to make their points, or ask about the health care legislation. Order was maintained through her cajoling and appeals to the crowds patriotism, as well as by a heavy police presence by the Houston police department. The latter was probably a response to unruly behavior that has occurred at other recent Town Halls held in various congressional districts in the Houston area, and throughout the nation. It is apparent from the large responses, and the sharp questioning, that this issue of Health Care reform is important and sensitive to many citizens. Jackson-Lee’s message was that we need reform, and she backs the president’s initiative in this bill. However, she pointed out that it is not final, has at least five versions, and will come out differently than now drafted. She also said it was about insurance for those who don’t have any or need less costly choices, and not about clinical health treatment from your doctor or hospital. She said that the government has been trying to improve health care for 60 years, and this is an important opportunity this year. She cautioned that if the bill is not passed, private insurance will continue to increase, perhaps as much as $1800 per couple per year, every year in the future. Questions from the floor ranged from continuation of private coverage, whether congressmen were reading the bill, where the money would come from to pay for the reforms, whether end of life discussions would lead to early demise of the elderly, how small businesses would get better coverage, whether illegal aliens would benefit from more health care coverage, whether abortions would be paid for in the new program, whether some hospitals that need financial help would receive any, whether the health care system can absorb and properly treat an influx of additional patients, who will make decisions on treatment options, and how can the VA system catch up with their case load. 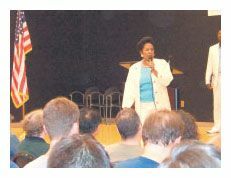 Jackson-Lee managed to answer most of these questions, although not always in a manner satisfactory to the audience. She closed with a summary that she was here to listen, that the billl was not final and still being rewritten to adjust to the many public comments, that this was about insurance and not medical procedures, and that it was important to get an many uninsured people into the system as possible, and this bill was the way to do that. 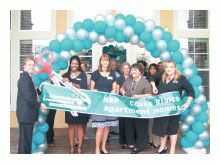 The NRP Group, LLC announced the grand opening of Costa Rialto Apartment Homes on Aldine-Bender, and Costa Vizcaya on N. Gessner. A ribbon cutting ceremony and reception was held on Friday, July 24. The celebration drew local dignitaries and is sponsored by Center Pointe Energy and Stewart National Title Services. This new community boasts 216 units with affordable 1, 2, 3, and 4 bedroom apartment home selections. Costa Rialto is located at 5015 Aldine Bender Road, Houston, TX between US Highway 59 and John F. Kennedy Blvd. The public is welcome to tour the homes. Costa Rialto residents will enjoy features including a spacious clubhouse with community room, swimming pool, children’s activity center, playground, fitness and business centers, in addition to a picnic area and grills. For more information about Costa Rialto Apartment Homes call 281.987.1300 or visit www.costarialto.com. The NRP Group LLC: Developer, Builder and Management Company. The NRP Group is a full-service developer, general contractor, and property manager providing a broad range of services. From start to finish, every project The NRP Group takes on is carefully contemplated and executed to maximize investment return, cost efficiency, productivity and satisfaction. The NRP Group has been recognized as NAHB’s 2009 Multifamily Development Firm of the Year and has been ranked number one in the Top 50 Affordable Housing Developers for 2007, 2008 and 2009 by Affordable Housing Finance. Since it’s founding in September 1995 by Alan F. Scott, T. Richard Bailey and J. David Heller, the company has experienced continual growth in the fields of single-family, multi-family and senior housing, as well as commercial and retail properties. In all, more than 12,000 multi-family and single-family housing units have been built with another 1500+ planned in 2009. In 2003, the owners formed NRP Management, which by year-end 2009 will manage more than 50 properties encompassing over 6,000 market rate and tax credit family and senior apartment properties in Ohio, Michigan, North Carolina, Virginia, Texas, Indiana, New Mexico and Arizona. The NRP Group, LLC has offices in Cleveland, Ohio; San Antonio, Texas; Phoenix, AZ; Raleigh, North Carolina; for more information, call (216) 475-8900 or visit www.nrpgroup.com. At their recent board meeting in July, the East Aldine District heard a report on progress in the widening of Aldine-Mail Route, from Airline Drive to Aldine-Westfield Road. Representatives of Wilbur Smith Associates reported that the 7 lane bridge over the Hardy Toll Road is 90% designed, with construction by the Toll Road Authority planned to start by the end of the year, or the first quarter of 2010. The report included a summary of a meeting held on June 23 between county officials, consultants, and representatives from the district, including David Hawes, Richard Cantu, and Scott Bean. At that meeting, Larry Allen of the Harris County Public Infrastructure Department, reviewed the plans for Aldine Mail Route between Airline and Aldine Westfield. 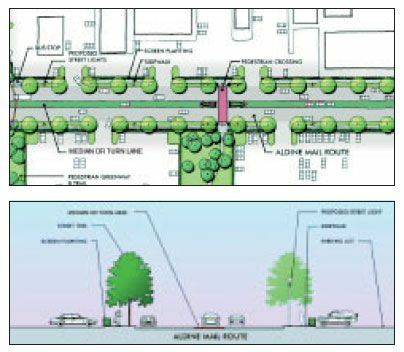 In this section, Aldine Mail Route will have two lanes in each direction, with a median and concrete curb and gutter. The engineering plans are in final design, and should be completed within 5 months, he reported. Construction would start next year. Precinct 1 is funding the project, which will cost about $16 million dollars. The project is planned to provide an excellent connector to the Hardy Toll Road and Hardy Road, and will improve mobility all along Aldine Mail Route. Most of the construction will be in existing right-of-way, but in some areas an additional 10’ of width will be required. Existing sidewalks will be replaced. East Aldine District will plan on new monumentation or signage, and landscaping. 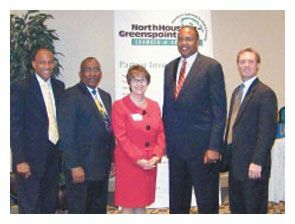 The North Houston Greenspoint Chamber held their annual Tribute to Education Luncheon last Thursday, with presentations by the three area Superintendents of the Aldine, North Forest and Spring Districts. Chamber president Reggie Gray emceed the event at the DoubleTree Hotel, which was well attended by Chamber members and educators. To set the tone of the luncheon, he reported on a meeting he had with State Representative Sylvester Turner regarding the use of federal stimulus funds this year to pay for educational needs, but that in the next budget session in two years, local districts will be faced with making up the monies that the state does not have available. In spite of the funding problem, two of the districts reported optimistically that they were meeting the needs this year for growth with new facilities that will open in their districts in the fall. Aldine ISD now has 61,000 students on 72 campuses, according to Superintendent Dr. Wanda Bamberg. A new Pre-K will open on E. Mt. Houston, next to Excamilla, and be named for Norma Garcia-Leza. In the following school year, Aldine will open a new Intermediate and a new Middle School. Also planned, for 2012, is a new high school on Ella Blvd. She was able to report that a majority of Aldine schools, 72%, are either Recognized of Examplary by state TEA standards. Even though her budget is balanced this year, she admitted that next year Aldine will look at a “rollback” election that would result in an increase in taxes, if the stimulus money is not available. In an effort to avoid a deficit budget, the construction of a new Pre-K has been delayed, and federal grants and Broad finalist monies have been pursued. She reported on the importance of the hiring of 3 new football coaches to the vaunted athletic programs in Aldine. Superintendant Dr. Adrain Johnson is starting his second year as head of the North Forest system. He joked about the importance of a football coach to a district, but then said he had hired a new one, with experience at Yale University, to replace the coach Aldine had hired away. Also hired were a new CFO and a new Police Chief, he said. “Things are changing at North Forest ISD”. He spoke about a new full day Early Childhood Program, funded by a $1,000,000 federal grant. He is putting emphasis on improving teaching quality, training them better, he said, so that if you can succeed at North Forest you can succeed anywhere. He has started a new Urban Teacher Transition Program, similar to medical residency, with 8 new teachers paired with Master Teachers for their training. Johnson mentioned that he has to deal with the community as well as the district, addressing problems of drop-outs, unemployment, health, and crime. Dr. Ralph Draper, Superintendant, said that his district now has 35,000 students, and is still growing, but not quite as fast as in the past. This year’s 3% growth compares with 6% previously. He is opening 4 new schools, three elementaries and one middle school. Spring is operating on a deficit budget, about $1.5 million now and perhaps as high as $7 million next year. The stimulus money will have to be made up locally in the future, he noted. In addition, the economically disadvantaged is the fastest growing segment of the community in Spring ISD, he noted. NORTHEAST HOUSTON – U.S. Congressman Gene Green has scheduled a series of Town Hall Meetings throughout his district in August, to report to the people on the work accomplished in Congress to date in this session, and to get opinions from the electorate in return. Normally these meetings during the Congressional break are civil, fact filled, sometimes personal, and not well attended. But this year, due to a number of factors including the public’s concerns over proposed changes in national health care insurance, the weak economy, and organized opposition, the meetings have been packed, often with raucous and rude audience members. The first of Green’s scheduled eight Town Halls was held last Monday night, Aug. 3 at the Melrose Park Civic Club, hosted by the club and its president, Judy Hoya. The room was crowded with about 150 persons in attendance. After opening remarks by Green, about the Stimulus package, environmental legislation known as Cap and Trade, and the Health Care Reform proposals, the audience began a series of questions, and often loud and combative statements. Several speakers in the audience said they preferred private insurance they now had, over any government programs that might replace them. Others were concerned over the high costs of health insurance, but afraid of restrictions and inadequacies of a government run program. Green did his best to answer the questions in an orderly way, even when the questioners shouted and expressed anger. He explained that over 30% of the population have no medical insurance, and the Obama proposal is for Universal coverage. He also pointed out that in the U.S. we pay the most in the world for health care, but get less than adequate care in return. Green was questioned as to whether he had actually read the healthcare bill, and knew what it said. He answered yes, although it was 1000 pages long, and he held up an annotated copy as proof. He also pointed out that it is not final, and at least 60 amendments to the bill have been proposed and are under consideration. The disruption in the meeting continued, with some turning to the subject of Iraq and Afghanistan. Also questioned was the need for “Cap and Trade” which will curtail the energy production in our area, or at least the emissions that result. Green pointed out his work on the Clean Energy Act of 2009, which provides for more energy in cleaner technologies, with more jobs created, and allowances to the local chemical industries. Green also issued position papers on the Stimulus Act, pointing out benefits to the local economy, and a paper on the Benefits to the 29th District from the Healthcare legislation. 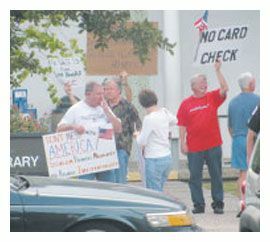 The noisy opposition to the Congressman’s remarks seemed to be planned and organized. According to some sources, a group known as the Houston Tea Party Society has a web site that encourages participation, and in fact disruption, of these meetings as a tactic to defeat the Democratic sponsored bills. Nationally, several organizations including FreedomWorks, Tea Party Patriots and conservative radio talk-show hosts, have been linked to the idea of causing problems at these town halls and therefore not allowing a thorough and objective discussion of the issues involved. At one of the town halls, an activist in the audience asked how many were opposed to government run health care. After a majority said they did, Green asked how many were on Medicare. About half said they were. Green pointed out that this was in fact a government healthcare program. 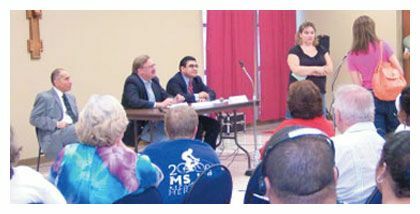 NORTH HOUSTON – As Congress debates the Health Care Reform bill, and prepares for a vote in September, local citizens and organizations have been meeting to voice their opinions and concerns. One of these meetings was held last Friday night, July 24, at Assumption Catholic Church on Roselane St. near Little York. Hundreds of speakers and listeners turned out for this forum, hoping to influence the details of the bill. The meeting was co-sponsored by Texans Together, and the church. Texans Together moderated the meeting, which after a brief introduction from the speakers panel, was given from the citizens who attended the meeting. Most of the comments and discussion were about features of House Bill HR675, known as the Single Payer bill. However, panelists pointed out that the bill is over 1000 pages in detail, there are several versions, and much of it is subject to change. Therefore many comments and answers could not be absolute. The bill, as now written, provide Universal coverage for all persons, includes all medical necessary services, does not increase national health spending, reduces administrative waste by $400 billion, includes a negotiated fee schedule, includes bulk purchasing of pharmaceuticals, and plans on savings through large scale cost controls. Another approach is known as the Public Option, allowing citizens and companies to choose whether to have government insurance or not. HCHD CEO David Lopez stated that Medicaid only covers 40% of healthcare costs today, and was in favor of reform. Armando Walle pointed out that Congressman Green is working on opening 2 new Federally Qualified Health Clinics in the area, one in San Jacinto City and one in the Airline/Little York area. James Mason of Texas Impact spoke on initiatives that are happening now to improve healthcare delivery, including a new small business support by Texas, to start in summer 2010. Other organizations that were represented and spoke included the TMO, and the Annunciation Church. Some spoke bitterly of lack of help with medical needs, others spoke about government programs that were better in Europe; others feared the bill would support abortion, or provide inadequate care, or mandate end of life decisions. A former Gallery Furniture was arrested and charged last week with setting the May 21st fire that destroyed the warehouse adjacent to the store’s main location on the North Freeway. Robert Carroll Gillham, 66, is charged with arson, a first-degree felony. Gillham was employed by the store five years ago. Gallery Furniture’s owner Jim McIngvale said he was happy that the arrest was made, and even more so that no one was injured in the fire. Investigators say that Gillham told several people, including his girlfriend, as early as last year that he was angry with McIngvale and wanted to burn the store. During a press conference last week, it was revealed that Gillham had borrowed his girlfriend’s red Dodge Stratus the day of the fire and when he returned it the girlfriend said she smelled gasoline in the vehicle. Arson investigators found melted red plastic and traces of gasoline in the northeast corner of the warehouse where the fire originated. Witnesses have also come forward to say that Gillham offered them money to start a fire at the furniture store. Two delivery drivers also reported seeing a white man in a hoodie sweatshirt driving in a red car away from the area behind the warehouse where the fire began. The two witnesses said the driver squealed the tires and almost hit one of the men as he drove off, shortly before smoke appeared. The fire occurred May 21 at 6006 Interstate 45 North. Houston Firefighters were able to keep the blaze from spreading to the showroom and no injuries were reported. The location reopened earlier this month. Officials have said the total loss was between $15 million and $20 million. Gillham is currently being held in the Montgomery County jail with a $150,000 bond after being arrested two weeks ago on burglary of a habitation charge. NORTH HOUSTON – A Job Fair that drew almost 4000 applicants, and a celebrity filled Ribbon Cutting marked the Grand Opening of a new production facility and corporate offices in Houston for Farouk Systems, a company that makes hair care products, such as CHI irons and BIOSILK hair care products. The company was founded in 1986 by Farouk Shami, and has led the hair care industry with its technological innovations. Recently, Farouk has made a commitment to move his manufacturing and labs from overseas locations to Houston. He challenges other companies to follow his lead and help stimulate the U.S. economy. On hand as celebrity ribbon cutters at the ceremonies were Governor Rick Perry, Houston Mayor Bill White, North Houston Greenspoint Chamber president Reggie Gray, and others. Farouk’s Houston facility is over 500,000 sq. ft. and will eventually employ over 1000 people. If his marketing approach is successful, Farouk said that many thousands more could be hired for his Texas production facility. In his remarks at the opening, Governor Perry credited Texas’ predictable regulatory climate, low taxes and skilled workforce with attracting jobs and companies from around the world. The governor spoke at the press conference at the factory site in North Houston, on E. Richey Road, where Farouk Systems announced the relocation of its manufacturing facility from South Korea and China to Houston, creating more than 1200 jobs and generating $26 million in capital investment, according to Perry. Part of the ceremonies included a stage show with entertainers, and a Texas BBQ. A job fair was held in conjunction with the grand opening. This took place at Greenspoint Mall, where hundreds lined up outside and inside the mall, to fill out preliminary applications, and to be called back for a detailed interview later. Most of the first jobs are expected to be assembly line workers, and managers. Starting wages were said by the company to be about $10 per hour. By the end of the day, the company announced that it had almost 4000 applications, for openings in the factory of about 1000 jobs. More hiring is expected in the future, they said. Applicants were also treated to a bus ride to the factory, and free hair styling with CHI and Bio-Silk hair care products.